This is amazing. It's perfect for doing a perfect line every time, and for making them absolutely even. Then why are there so many mixed reviews about it? When reviews of this new eyeliner started to appear, way before it launched, I was a bit skeptical. Some of them were good but a bit superficial, some of them were straight bad. When it first came out I went to Sephora, had a look, swatched it and left it there. The reviews about dry flaky formula and impossibility to make an even line had completely put me off. Then I saw Goo Roo Beauty review on YouTube. She does the most amazing detailed reviews, and really made me understand the problems people were having. The main thing you need to know is that the applicator is designed to hold the product inside, and you’re not meant to use the product that comes out from the tip. You turn the end (a couple of clicks each time are enough) and the smallest amount that comes out from the tip needs to me rubbed off on a tissue. Then you go straight into lining the eyes: I like to start lining the lash line, then do the flick (which is embarrassingly easy to do with the angled applicator) and then connect the two. It’s really incredibly easy, and I’ve never been an expert in lining my eyes. I’ve always had problems with the line being different from eye to eye (my eye socket is not exactly the same on both eyes) or being too thick (I don’t have a lot of lid space so a line too thick completely covers the lid when I open my eyes). Gel liners with a brush give me a line that’s always too thick, liquid liners I find impossible to use (mostly down to me disliking the formula and the fact that when it goes on the lashes makes mascara impossible to apply) and felt tip liners are the best I could get until now even though they needed too much work to be used daily. This solves all of my problems: once you remove the little bit that comes out that might have dried out you get a fluid gel that is really smooth to apply, and in a matter of seconds you get a perfect even line. The first couple of times is better to be careful, because the formula sets really fast and if you try yo go over the line once it’s dried then you will get a little bit of flaking. But once you get the hang of it you will be hooked. It’s become my eye makeup of choice for the days I want to be ready really quickly, which is unheard of from me. The only doubt I have is how long will the product last. I’ve only had it for a little bit less than two weeks so I’ve no idea at all. But you know what? I like it so much that even if the constant use means I will run out quickly I’ll save somewhere else to buy this again and again. 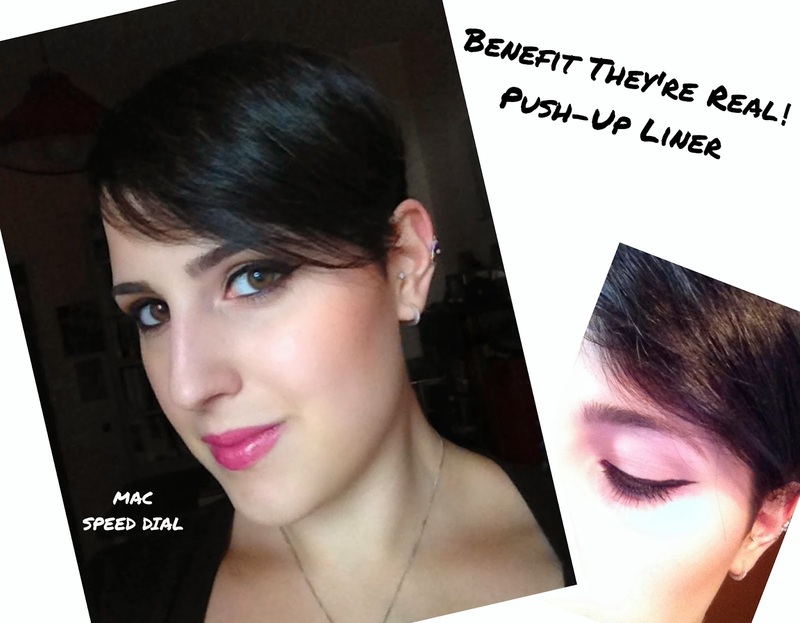 Benefit has done it again: first Big Easy and now the Push-Up liner. They’re jumping on the top of my favourite brands! Have you tried this liner? What do you think about it? Let me know! Little bonus: have a look at the photo below to see MAC Speed Dial in action! È favoloso. È perfetto per disegnare una linea perfetta ogni volta, e per farle assolutamente identiche. E allora perché ci sono così tante recensioni discordanti? Quando sono cominciate ad apparire recensioni di questo nuovo eyeliner, ben prima che uscisse, ero un po’ scettica. Alcune erano buone ma superficiali, alcune erano direttamente pessime. Quando è uscito sono andata da Sephora, ho dato un’occhiata, l’ho provato sulla mano e l’ho lasciato lì. Le recensioni che parlavano di una formula asciutta con cui era impossibile fare una linea perfetta mi avevano fatto perdere interesse. Poi ho visto la recensione di Goo Roo Beauty su Youtube. Fa le più belle e dettagliate recensioni, e mi ha fatto davvero capire i problemi che chi lo provava stava incontrando. Il dettaglio principale da sapere è che l’applicatore è disegnato per contenere il prodotto all’interno, e non è fatto per usare il prodotto che esce dalla punta. Si gira l’estremità inferiore (un paio di click ogni volta sono abbastanza) e quella piccola quantità che esce dalla punta deve essere rimossa con un fazzoletto. A quel punto si va direttamente a disegnare la linea sugli occhi: mi piace cominciare a delineare la linea delle ciglia, poi disegnare la codina (che è terribilmente facile con l’applicatore angolato) e poi collegarle. È incredibilmente facile da usare, e non sono mai stata un’esperta nell’uso dell’eye-liner. Ho sempre avuto un problema di linee diverse tra un’occhio e l’altro (la mia piega palpebrale non è esattamente uguale da entrambe le parti) o di linee troppo spesse (la mia palpebra non è particolarmente spaziosa quindi una linea troppo spessa occupa tutta la palpebra quando apro gli occhi). Gli eyeliner in gel applicati con il pennello rendono sempre la linea troppo spessa, trovo impossibili da usare gli eyeliner liquidi (soprattutto perché non amo la formula e il fatto che quando vanno sulle ciglia rendono impossibile applicare il mascara) e gli eyeliner a pennarello erano il meglio che potessi usare fino a questo momento anche se erano un po’ troppo laboriosi per essere usati tutti i giorni. Questo eyeliner risolve tutti i miei problemi: una volta rimosso quel poco che esce dalla punta che potrebbe essersi seccato un pochino si ottiene un gel fluido che è scorrevole nell’applicazione, e in una manciata di secondi si può fare una linea perfetta. Le prime volte conviene stare attenti, perché la formula asciuga molto velocemente e se si prova a passare sopra alla linea più di una volta la linea tenderà a sbriciolarsi. Ma appena si avrà acquistato un po’ di familiarità con la stesura non si potrà più farne a meno. 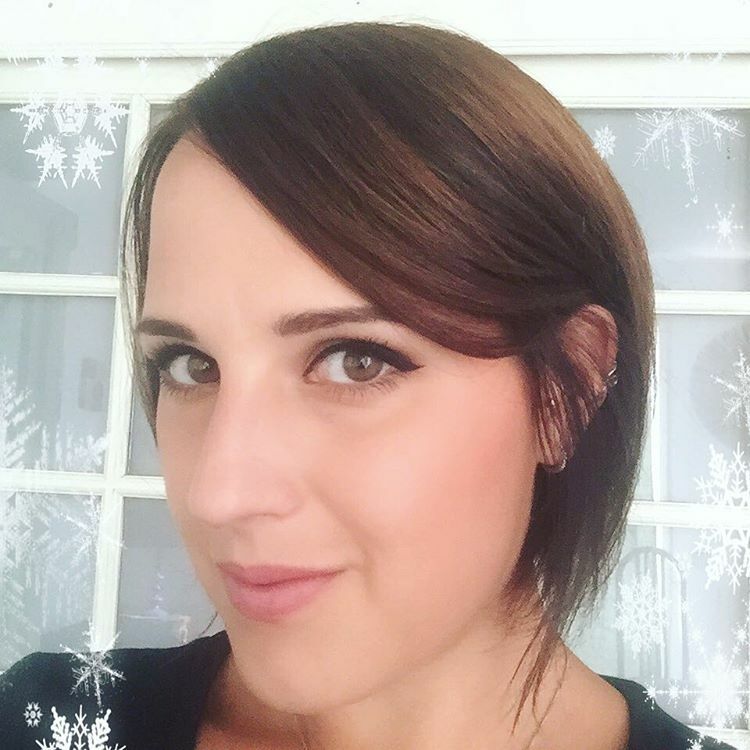 È diventato il mio makeup occhi per quando voglio essere pronta in fretta, cosa per me inaudita. L’unico dubbio che ho riguarda alla durata nel tempo del prodotto. Ce l’ho da poco meno di due settimane e quindi non ne ho assolutamente idea. Ma sapete una cosa? Mi piace così tanto che anche se l’uso costante significherà che lo finirò presto preferirò risparmiare su qualcos’altro per poterlo comprare ancora e ancora. 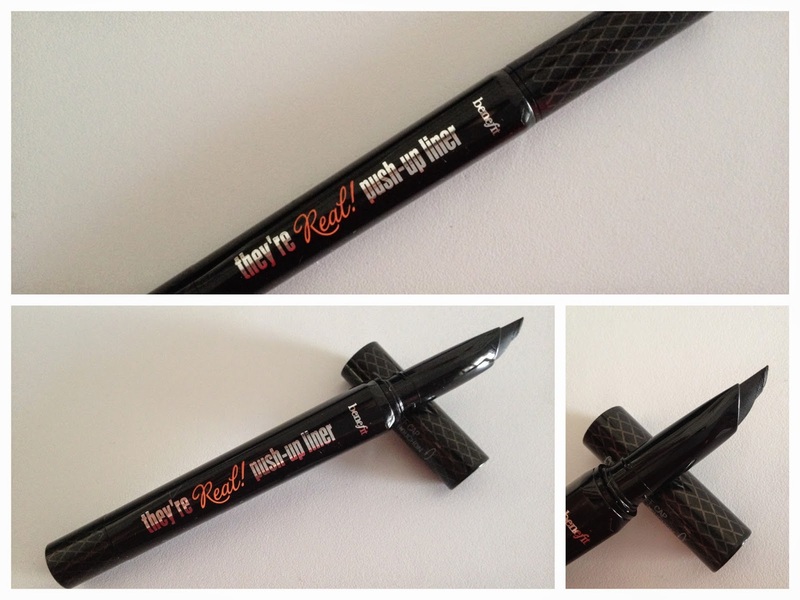 Benefit l’ha fatto di nuovo: prima Big Easy e adesso questo eyeliner Push-Up. Sta salendo in cima alla classifica delle mie marche preferite! Avete provato questo eyeliner? Che cosa ne pensate? Raccontatemelo! Piccolo bonus: date un'occhiata alla foto sopra per vedere MAC Speed Dial in azione! Labels: Benefit, Eyeliner, MAC, Push-Up Liner, Review, Speed Dial, They're Real! I tried a sample of this, which doesn't have a twist end and was quite small making it fiddly to apply. Now that they've released the full size I'm more interested in trying it again, because it seems to solve all the problems I had with the sample. Hey Gyudy, thanks for the tip! I've got to check that tutorial out as well. I think that was part of the problem I was having: I didn't know how much product I had to twist out! I really want it to work though. I like the applicator A LOT.